Our pizza night growing up was rarely an affair catered by Pizza Hut or Dominos. We used to frequent a family-owned joint that most Northern Virginians are probably familiar with called Joes. We’d get take out from the Bailey’s Crossroads location, ordering doughy Sicilian pies with mounds of thinly-shaved toppings. Their crusty calzones hid pools of creamy ricotta, melty mozzarella and tender ham. They made the steak and cheese hero that I continue to judge all others against. 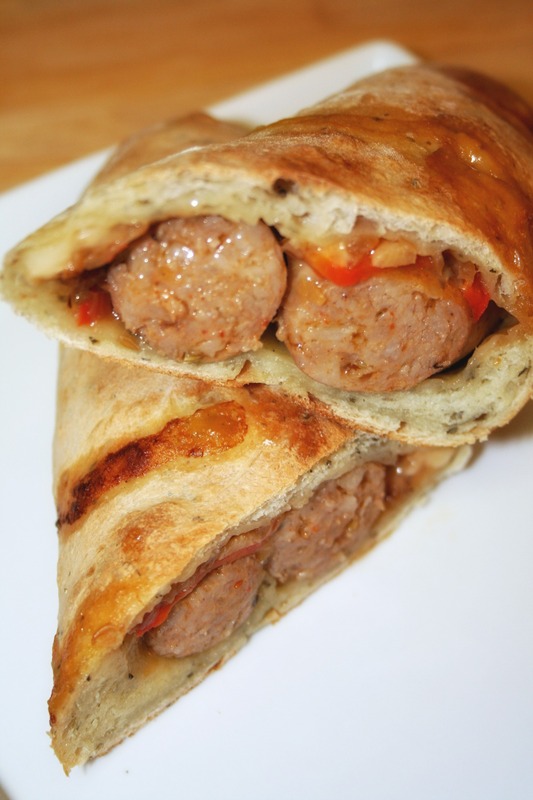 And their hippie rolls, a sausage stromboli of sorts with a tasty touch of crushed red pepper, became the fodder for regular, late night food cravings. Pliant and chewy pizza dough held sweet roasted peppers and onions and a smidge of mozzarella cheese. My dad would order a couple and slice them into rings for everyone to snack on, and they rarely lasted long. Our old haunt closed a long while back (supposedly a feud between the brothers that owned the chain) and I was never able to find another place capable of making them the way I’d grown to love them. Some put tomato sauce in the middle and others got the proportions of the filling all wrong. I’ve taken to meeting my cravings by making them myself. The most difficult part is the pizza dough, which can easily be picked up from Whole Foods or Trader Joe’s with great results. You’ll also want to break out your pizza stone as well to keep the bottom crisp and tasty. No pizza stone? Try lining a cookie sheet with parchment paper to help things along. Preheat the oven to 400°. Line a cookie sheet with foil and place the sausage on top. Poke each link with a fork a few times and put the entire mess in the oven. Bake for 25 minutes or until the links are cooked through. Remove from the oven and set aside. Crank the oven up to 450° and put your pizza stone in the oven to warm. In a skillet, heat the olive oil. Add the onion and bell pepper and cook over medium heat until caramelized and lovely. Add the garlic and fennel seeds and cook until garlic begins to become fragrant, about a minute. Take the veggies off heat and set aside. Flour a cutting board or clear space and take out your dough. Cut in half and gently stretch each ball into a wide circle, about 7 to 8 inches in diameter. If the dough is difficult to stretch, allow it to rest for 10-15 minutes before forming into a circle. Sprinkle half of the cheese on the middle of the dough, top with the veggies and then two of the links of sausage in a long line. Roll up the two sides of the dough to form a skinny roll with the top and bottom ends open. Slice a few holes in the top with a sharp knife. Take the pizza stone out of the oven and place the roll on top. Repeat above steps with the rest of the dough, sausage, cheese and veggies. Pop the two rolls into the oven and bake for 15 minutes. Let rest for a few minutes and then eat with a side of zippy marinara. How can one not love something called a Hippie Roll?!?! Love it! Apparently it was slang for pepperoni back in the day? Who woulda thunk it? My mom used to work at Joe's! Hippie rolls are a family favorite for us as well! Love it! I went to Joe’s recently and asked if any of the locations made them still, and they said no 🙁 Oh well – guess I’ll have to keep on cranking them out myself. Joe’s in Woodbridge still does! Having them for dinner tonight! I totally agree – I have had yet to eat another sausage roll that even comes close! I don’t know why the Lee Highway Joe’s that’s still open won’t make them, but, oh well. With regards to the sausage, honestly, I have had similar luck using artisan sausage from a good Italian grocer as I have using Giant or Safeway brand. Roasting the sausage beforehand seems to do the trick for getting the flavor right. Since you are going for authenticity of taste, though, here are a few more tips – in the picture I used red peppers, but you’ll remember that Joe’s always used green peppers in their rolls. Also, you could order a hippie roll hot or mild – if you liked the hot, make sure to add that extra crushed red pepper. Lastly, I cannot underestimate the need for a pizza stone – we can’t get our home stoves as hot as a true pizza oven, so warming a pizza stone in the oven is essential to get that crisp bottom crust. Rhonda Huston Nash Found one! Thank you for posting this. I moved from VA years ago and for some reason those Hippie Rolls came to my mind for the Superbowl this year. I have not had one in 20+ years, but I still remember the way they tasted. This recipe was spot on. I made mini versions of them, but the flavor was just as I remembered. Thank you so much for putting this out there.